Home » Events » 8-24-2013 Pond Walk for Kids! 8-24-2013 Pond Walk for Kids! 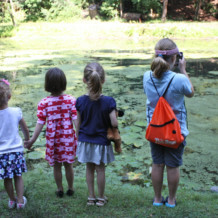 Join us as we explore the plant and animal life at the pond in Glen Providence Park! The pond was created in 1936, primarily for fishing and ice skating. It hosts an array of wildlife, including Muskrats, Bullfrogs, Pickerel Frogs, American Toads, Green Herons, Belted Kingfishers, Fishing Spiders, and plenty of fish, turtles, and dragonflies. Aura Lester led our fun and popular Pond Walk last year, and we are delighted to have her back this year! With a degree in biology, Aura’s career experiences include environmental educator in Philadelphia and research assistant in Alaska(!). She is known as Mrs. Lester at Great Valley High School, where she has been teaching biology and environmental science for the past 9 years. – RSVP by emailing FriendsoftheGlen[AT]gmail.com so we know how many to expect. – Be prepared for uneven (possibly wet) terrain: wear shoes that can get wet, bring binoculars and cameras if you’d like, and of course bring your curiosity! – While we welcome leashed dogs to many of our park events, this time we will be looking for skittish turtles and other pond life, so please leave those cuties at home.